Konami’s Silent Hill HD Collection coming out January 2012 will have redone voice tracks. Silent Hill 2 and 3 will have lines and redone and possible changed with new voice actors. The Silent Hill games weren’t known for their voice work so this is a welcome change. Silent Hill 2 will have the option of keeping the original cast’s voice work in the game but Silent Hill 3 has not. It is shocking that Konami would go through the effort to redo the dialogue because most HD releases don’t put half the effort into their re-releases. I am not quite sure why Silent Hill 3 would not have the original audio as an option but I’m not heartbroken over it and I have it for the PS2 if I really want to listen to Heather Morris again. Written by Twisted Ideas I stumbled across this game when looking at the free games for Playstation Plus users. I have always had a fondness of trading card games even though I haven’t bought a booster for any card game for at least eight years now so I gave it a shot. I thought it was okay at the time but was too busy but I’ve played it again recently and it is actually pretty nifty. The interesting thing with this game is that there isn’t an accompanying paper version of the game and in terms of trading card games is actually is different from Magic the Gathering, Pokemon, Yu-gi-oh and other trading card games. 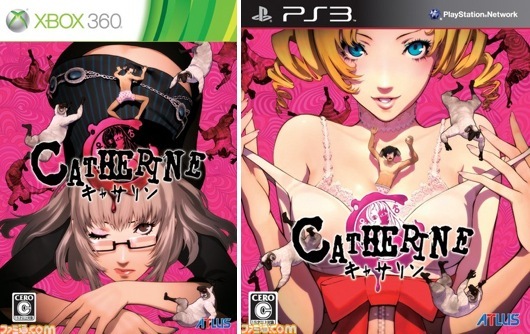 Catherine is developed by Atlus’s Persona Team know for the popular Persona JRPG series. Unlike Persona, Catherine is a puzzle game. You play as Vincent Brooks, a software developer in a long-term relationship with his girlfriend Katherine. You wake up in a nightmare climbing a collapsing tower. The next morning Vincent and Katherine discuss their relationship. Later than night after his friends leave the bar Vincent stays to reflect and meets a woman. He finds himself in the nightmare again discovering that if he can survive and climb the eight floors he can escape the nightmares. Upon waking up is in bed with the beautiful woman from the bar also named Catherine. This footage has just caught my attention for a new Phantasy Star Online game. I don’t know how many of you played the first Phantasy Star Online but I spent a lot of time playing the Gamecube version. By today’s standards Phantasy Star Online Episode 1 and 2 is very slow and simple. PSO2 looks like it has much more fluid and varied combat. You can jump and fight in the sky, manually aim firearms and magic can be cast rapidly. There also seems to be a great deal of character customization with outfit designs. The dragon boss was seen being jumped on to attack a different point of it possibly to deal more damage. Hopefully there will be other large bosses that take advantage of the size of enemies. This is a Windows exclusive game which is disappointing but I am looking forward to seeing more of this game in the future. The third installment of Naughty Dog’s Uncharted franchise is finally here. Nathan Drake is back again on another Indiana Jones style adventure exploring ruins and fighting bad guys. While the gameplay has always been fairly average the spectacle, look, feel, writing and characters standout from any other game in the shooter genre. Does Uncharted 3 live up what Uncharted 2 did for the series or will this be a forgotten treasure. You play as Nathan Drake along with his good friend Victor Sullivan are set to find the Iram of the Pillars the lost city that they believe that Sir Francis Drake discovered and kept secret from the world. The story begins in a bar in England as Drake and Sully attempt to sell Sir Francis Drake’s ring to a shady organization. The two men knowing how to have a good time cause a commotion to draw out the leader Katherine Marlowe who holds the half of key to solving Sir Francis Drake’s secret voyage with the ring being the second half. A new game from Suda 51 and Grasshopper Manufacture has come to my attention called Lollipop Chainsaw. Yea… I want to play it. Suda 51 is known for his bizarre and unique style as seen in Killer 7, No More Heores and Shadows of the Damned and this is no different. We’ve been hit with a rush of zombie games for the couple of years but let’s hope that this isn’t just another average hack and slash. Coming out 2012 get ready to kill some zombies.